What a perfect place! Check out our 5-star reviews and YouTube Video. Everything is new in this absolutely beautiful spacious, corner 2 bedroom with stunning ski slope views and a large private deck - perfect for relaxing or entertaining!! This condominium has been completely remodeled, from the drywall texture and trim to all new furniture, fixtures, and appliances. Luxury bedrooms and bathrooms with custom slate flooring and floor heating. Custom furniture and built-in cabinetry. Wood burning fireplace. All rooms feature flat screen TVs with DVD players. Kitchen remodeled and has new stainless appliances. Slab granite counters in kitchen and bathrooms ...... and more. Looking for a family getaway? Come and enjoy our spacious (over 1550 square feet of living space) two-bedroom condo. 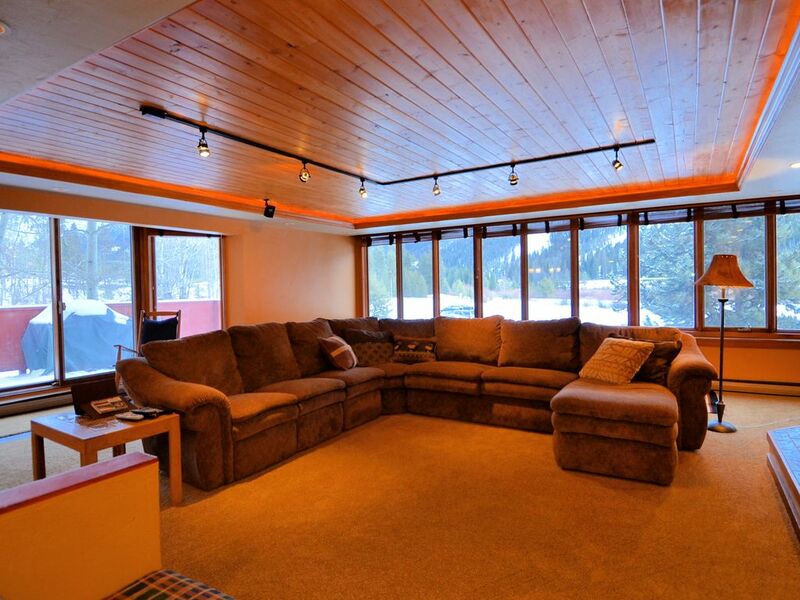 This condo is situated in Keystone Lakeside Village. Through its full glass wall this unit offers incredible mountain views of the ski slopes and Snake River. The free Keystone shuttle bus can take you to the ski lifts in 5 minutes - there is a bus stop/shelter right in front of the building with buses running every 20 minutes. Enjoy skiing/boarding during the day and/or night. There is a private ski locker for our condominium on the first floor in our Decatur building. Keystone offers the only night skiing in Summit County! Right next to Decatur building, there is the Keystone Lake. Keystone Lake offers paddle boating, stand up paddle boarding, kayaking and canoeing during the summer. In the winter months, Keystone Lake becomes an ice skating rink - it is the largest outdoor maintained skating rink in North America. The ice surface on Keystone Lake (along with the hockey rink that is also on the lake) is maintained daily with the use of a Zamboni machine. Skate rentals are available at the Keystone Adventure Center. You'll never forget the fun! The lights turn on at night, so you can skate or play hockey late into the evening. Restaurants of every type, coffee shops, ice cream shops, a convenience store, ski rentals, shopping of every type and nightlife are just steps from your door. We have a Pack N Play in our unit along with a comfortable rocking chair. We also have Legos and many board games for the Kids. In addition to the surround sound and HD television in the living room, each bedroom has a HD television with DVD player for unwinding after a busy day. Aside from the skiing at Keystone, we are only 6 miles from A-Basin, 20 minutes from Breckenridge and Copper Mountain and 30 minutes from Vail. Summit County offers free public transporation from Keystone to any one of these ski areas. E-mail us for availability and/or reservation. We will provide you all the necessary information when your reservation is confirmed. Indoor pool, hot tub and sauna in next building (included). Can pay for daily access to fitness center and spa at Keystone Lodge. Indoor heated pool is very short walk from building. Very comfortable, large living room with great views. Stainless steel, with freezer and automatic ice maker. Fully-equipped with everything you would need to prepare all of your own meals. Perfect mountain and resort views - private balcony has table with 4 chairs and two additional Adirondack chairs for relaxing. Private propane gas BBQ grill on balcony available for use. Perfect mountain and resort views - balcony has table with 4 chairs and two additional Adirondack chairs for relaxing. Private propane gas BBQ grill on balcony available for use. Sauna is at clubhouse along with Indoor heated pool and hot tub - a very short walk away from building. Separate locker room facilities, with complimentary towels provided. Very clean and comfortable place to stay! We had plenty of space to spread out. We stayed for a long week end to ski with our 2 grown kids and loved the bathroom and bedroom set up. Plenty of seating in the family room to comfortably watch tv and relax. The only downside would be the stairs you have to take luggage up and down once entering the condo, but it really isn’t too inconvenient. Overall, we loved it and would definitely stay here again. We loved how large and spacious the condo is and how well stocked with kitchen stuff, games, toiletries, etc. We have a family of 4 and then had friends (another family of 4) staying nearby who joined us a few nights for dinner and never did we feel crowded. It is very convenient to the shuttle to the slopes, has ski lockers for storing skis, and is one of the only units with a deck. The owners were very quick and responsive when we had an issue and resolved it immediately. And the staff was also quick to respond when we needed extra batteries for the remote or more fire starters for the fire. There is also a great view of the slopes. We would definitely stay again. This is our 2ndtime staying in this unit. It is fabulous. It is spacious, clean and the heated floors in the bathrooms are great. It is right on the bus stop for easy access to mountain house. We will definitely return. Thanks for another great vacation. Melissa E.Where do you live? Keystone is the best place for families to ski and play!! Keystone Ski School has the best instructors and my kids had a blast and beg to go for another day, this are second year and they do not dissapoint. Even for Spring Break there were no long lines and we were pleasantly suprised how not crowded the resort was. The condo has a beautiful view of the mountains, the shuttle is right next to the building as well as Keystone Lake which you can ice skate on in winter. We would take walks and let the kids play at the playground in the evenings and were able to view several moose out near the rivers edge. The condo itself was even nicer than the pictures and very roomy for our family of six. Very comfortable and accommodating, especially the living room area which is hard to find. My family especially enjoyed getting outside and spending time on the patio deck to play with snow and watch the mountain. The room service/concierge was amazing and immediately assisted with needed towels or toiletries. The location is only a few minutes from the slopes if you are driving and convenient to Silverthorne, Dillon & Frisco as well, which is where we go to eat and for groceries. And the garage door everyone comments about my family never even noticed. Our family had the best time and can't wait to go back to Keystone and this fabulous condo! Thank you for your nice comments. Keystone in March is great isn't it?? We hope to update a few of the pictures on our website within the next month. We have recently purchased new mattresses for the second bedroom, added some new end tables and new artwork. We are glad you enjoyed your stay. No pets please. Smoking is prohibited in our building and condominium. Usage of cannabis and any other federally prohibited drug is not allowed on the premises. Further, our guests may not engage in any illegal drug-related activity, including but not limited to medical cannabis on or near the premises.